In a medium bowl, mix together the lamb, eggs, garlic, pepper and nutmeg until well combined. Form into patties. Heat 2 tablespoons oil in frying pan. 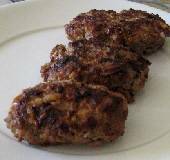 While hot, add patties and fry until inside is no longer pink – about 5 minutes per side. Add more oil if necessary. Add sauce, if using, and bring to a boil. Simmer for 5 minutes before serving. Good with sauce over mashed potatoes or alone with fried potatoes.